Chieftain Alisdair MacDonald seeks to preserve the peace of the Glen of Many Legends, and to keep the King’s hand from touching the three warring clans that reside there. The three clans don’t exactly like each other, but Alasdair is drawn to Lady Marjory Mackintosh, her brother is considered his enemy. But Marjory is a sweet lass and he means to win her over somehow. Marjory Mackintosh, made a pact with her two friends that they would be peace to the Glen by marrying oppsosing sides of the warring clans, to bring order from the chaos. Two of her friends have done what they all agreed to. Marjory has been wanting Alasdair for quite some time and means to win him over even if that means seducing him. The only problem, she has to find a way to get away from her over protective brother. She knows that her brother means well, but Marjory knows who her heart and body really desires. But there is a evil plan afoot, and with conflicts between the warring clans, Marjory may be a sacrifce to a viking alter, if she doesn’t find a way to change circumstances, even if it means going against her brother to stand by the man she loves. Alasdair MacDonald, is Chief of his clan and is trusted by the King. Alasdair is trusted by his men, and I loved this hero so dang much. He really impressed me. Alasdair was so entertaining. He is quite human, makes mistakes, and lives up to them. He doesn’t excuse bad behavior and supports his clan in every way. Alasdair, doesn’t care too much for Marjory’s brother, that is for sure. But the way that Alasdair treats Marjory is something to highly respect. 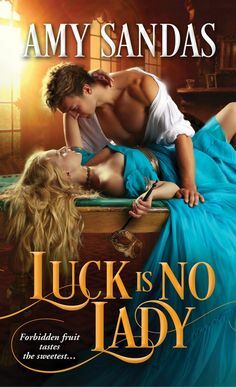 He is so careful with her, and treats her like a sweet lass, and not one of his enemies. He doesn’t see her as a enemy, but his future. Alasdair is rough around the edges, but when it comes down to the important things, he will protect his people and those he loves the most no matter the cost to himself. Love how honorable this character is. Marjory is the type of heroine that goes after what is really right and she follows her heart even if it has disastrous results. Marjory has had genuine feelings for Alasdair for quite a long while. I love how honest she is about him (all to everyone except her brother who would probably lock her in a convent if he knew her thoughs on Alasdair 🙂 but I really enjoyed how spontaneous she is, spirited and wants freedom to make choices for herself and not what her brother decrees. Marjory is also kind hearted and sees both sides and she knows what needs to be done and takes action. I liked the way she stands on her own two feet and doesn’t back down. This is a story I have been meaning to get to, ever since this series came out a couple of years ago. My library had the first two book, but they just got the third book in (have no idea why it took so long) but I adore this author. She writes historical romance in ways that it should be written. Sue Ellen Welfonder is fabulous, and I love what she has created with these three warring clans. I will admit, its been awhile since I had read anything by her, so it took me a few chapters before I really became engrossed in the story that builds. I highly recommend that if you have trouble, stick with the story because it gets better as it builds in plot. I do recommend reading the series in order. You don’t have to, but it helps. I almost wished I had read the first two books again before reading this one. There were many aspects of the series I had forgotten and loved beeing brought back into the fold with. We see some magical elements that play a role in the story. In all three books, there is a magical element and I love how Welfonder brings the magic of the highlands to life. 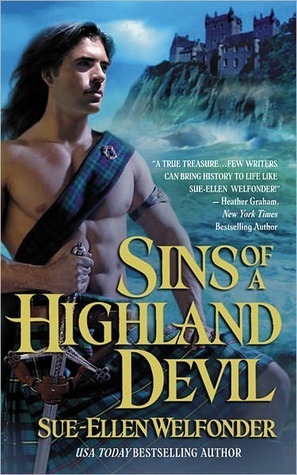 The way of the myths and beliefs of the time become vivid in print in Seduction of a Highland Warrior. This was such a emotional punch for me, and I loved the way the romance develops. Both of these characters deal with misunderstandings, and have to fight inwardly to be together. They fight to be together, even against all odds. There is some mystery revolving the story, and an enemy that wants to destroy the Glen. This added element brings more conflict to the story, but not in a overpowering way. It builds more substance to the plot and piques the reader’s interests. The ending was simply magical, satisfying and completes the series. My favorite cover of the series…I just love it. What makes it fantastic is the background, withe the sunset and the castle with the ocean. Love the hints of the storm in the sky. and man I love the colors of the Scottish Plaid. 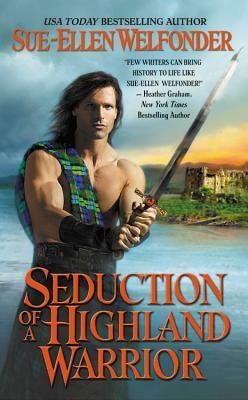 Seduction of a Highland Warrior wraps up this delightful series in such a fantastic and magical way. 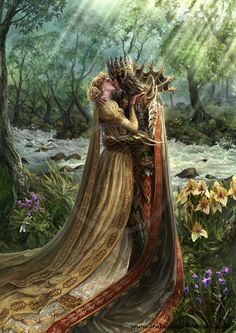 We see true love conquer all and this romance is passionate and intricately written. A SCOTTISH GEM! !